As we near the end of our second year in Brooklyn, it's time to reflect on the hard work and success of all our students. We take a moment this week to highlight the achievements of a few enterprising middle school students, and look forward to others’ successes in the coming months and years. In the wake of the announcement of astounding college acceptances of our first graduating class at BASIS Independent Silicon Valley and national high school rankings from The Washington Post and U.S. News and World Report (both of which featured BASIS.ed schools prominently at the top) we share with you a proud accomplishment of some of our own students here at BASIS Independent Brooklyn. We couldn't be more proud of our burgeoning Model U.N. team. In its first year competing, teammate members Palak and Sima won Best Middle School Delegation for their resolution on Internet Freedom of Speech at the Change the World Model U.N. conferences earlier this year! Model UN is a perfect fit for BASIS Independent students. It draws on a number of very different but overlapping skill sets, and requires its participants to process and understand all sides of a problem or issue. Beyond the traditional liberal arts curriculum taught at most American schools, BASIS Independent students take some additional, less common classes - including Logic, Economics, Connections, Engineering, Latin, Mandarin, and Physical Geography - all alongside students from around the country and around the globe. 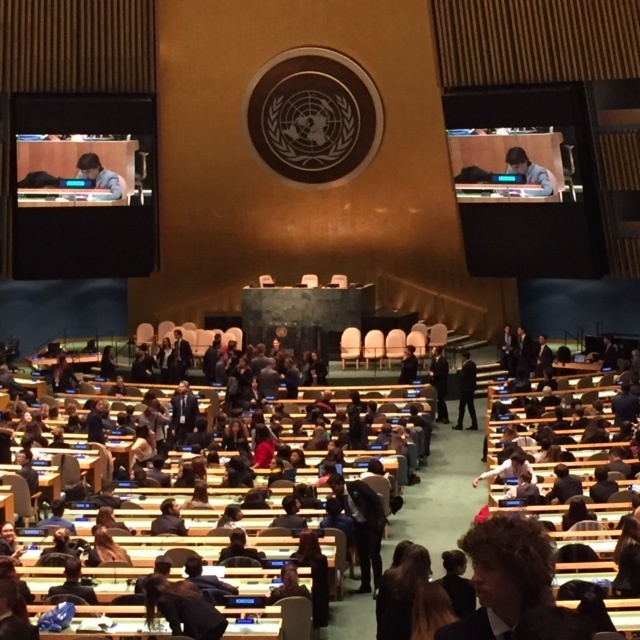 So, when our students took their first steps into the real United Nations Headquarters on the Upper East Side of Manhattan for the Change the World Model UN Conference earlier this year, they weren’t in a foreign place; they were home. At the conference, students represented member nations and developed resolutions, which were then debated and voted on by the General Assembly. 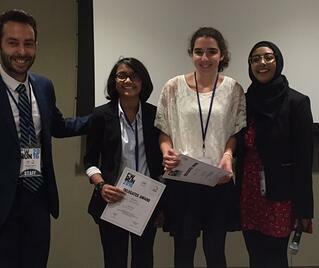 In our 10 member BASIS Independent Brooklyn team, Palak, a 7th grader, and Sima, an 8th grader, represented France and won "Best Middle School Delegation" for their resolution on Internet Freedom of Speech. Palak and Sima (center) collect their award for Best Middle School Delegation! The proud winners were delighted to discuss their experience and explain why they enjoy Model UN so much. "Meeting other people. Talking world topics. I like almost everything about [Model UN]. Wherever there were people talking, I'd try to get involved in the conversation," Palak remarked. So, what's it like to do Model UN in the real UN? "It was a little nerve-racking to begin with. It's so big," Sima reflected. "But we were prepared and I really enjoy writing the resolutions. And arguing; I love to argue." When asked why she thought she was so successful at the conference, Palak stated that, "being at BASIS really makes you think [about this stuff] - Logic and History helped a lot, for example - and Ms. Tenaglia and Mr. Thacker prepared us really well." And does she have any goals for next year? "Next year, I'll be Vice President, and I want to get even more people involved... Oh, and I want to start a debate club!" Students graduate from BASIS Independent Brooklyn with the skills to learn, thrive, and succeed in our competitive modern world. But, while they're here, they get to develop and build on their evolving skills in a challenging, fun, and dynamic environment. During the school day, students are exposed to a broad and robust array of subjects and disciplines taught by passionate experts, and, after school, students get to exercise new passions and projects in our extracurricular programs, taking advantage of all the facilities of our amazing new schoolhouse. In the coming months, we look forward to more great achievements, including our first school wide music production, Oliver!, and the finals of our all-ages Basketball tournament!